Our Company is heavily committed to Food Safety and takes continuous improvement of its products and processes as a fundamental priority. On January 28th and 29th, our Quality Assurance Team received on-site training based on the new version of the World Food Safety Standard – BRC V08. Our facility is located in the city of General Deheza, Cordoba, which constitutes the heart of the Argentine peanut area. The group that undertook the BRC training was composed of staff from the different Business Units: Extrusion, Flour Mill and Peanuts, as well as representatives from the HR Department. The purpose of the BRC Global Standard is to lay out the safety, quality and performance criteria that should be applied in an organization dedicated to the manufacture of food products in order to comply with its legal and consumer protection obligations. The BRC standard places a big emphasis on the commitment of the management team and is based on the Hazard Analysis and Critical Control Points (HACCP) program, which constitutes a foundational part of a Quality Management System. Peanut Plant: started in 2001 with the Certification of Good Manufacturing Practices and Hazard Analysis and Critical Points (HACCP), migrating to BRC in 2009. 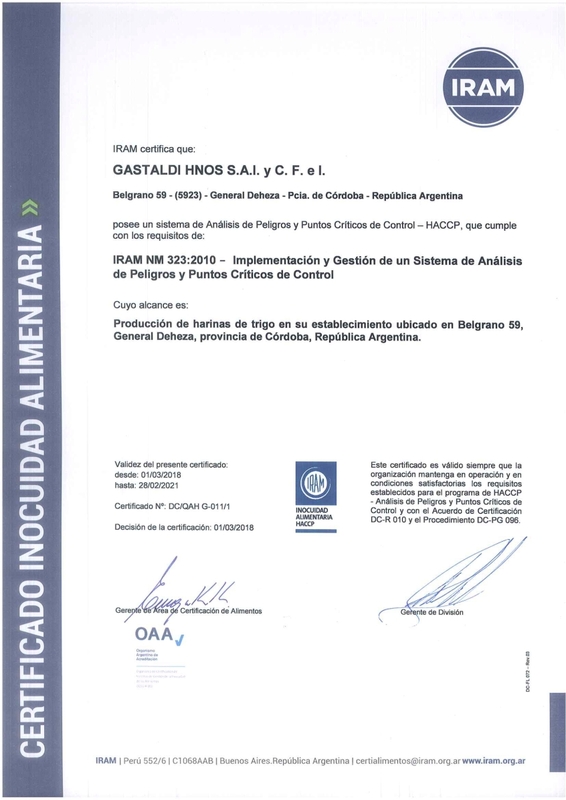 By doing so, Gastaldi became the first Argentine Peanut Plant to achieve this renowned certification. The latter is renewed on an annual basis through a third party audit that verifies compliance with the requirements of the standard. Wheat Flour Mill: Certified with Good Manufacturing Practices since 2005 and Hazard Analysis and Critical Points (HACCP), since 2015. Extrusion Plant: Certified with Good Manufacturing Practices and Hazard Analysis and Critical Points (HACCP), since 2015.